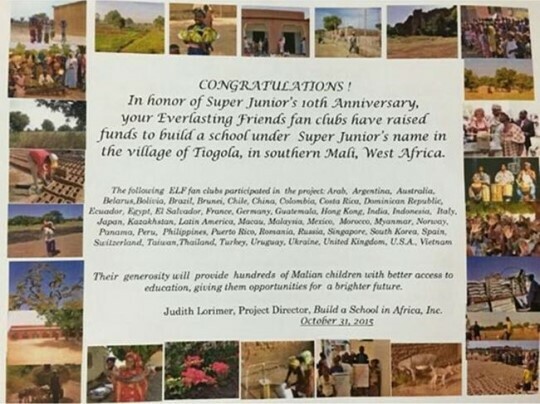 USA ELF partnered with ELF around the world to sponsor a school in the village of Tiogola, in southern Mali, West Africa. Sapphire Blue Ocean – With Mouse Ears! In an effort to fill Staples Center with blue lights, our fan club gave away 1,250 light up mouse ears and devil horns. We spent the evenings before adding nearly 2,500 customized stickers, with the words “I (heart) Super Junior”, to each ear. Below is a photo taken by @gaemyeolichi during the big night. We printed 10,000 copies of our concert banner and gave them out in front of the Staples Center to show our wonderful boys that USA fans exist and that we love them. The idea for the banner was a collaboration between USA ELF, @StupidHyukjae, @gxg203_rinahlee, @_eggsabel and @MelzHyun. @StupidHyukjae painstakingly designed every member to perfection. A big thank you to all! We invited ELF to come and hang out with us for a fun filled night in Koreatown. We visited Choice Music and the Galleria Korean Market in Koreatown Galleria, Music Plaza in Koreatown Plaza and concluded with an amazing dinner at Palsaik Samgyupsul Korean BBQ. We watched the Mamacita music video – twice! – while making new friends and enjoying delicious food. ELF from around the world sent in their photos and letters to create a beautiful photo book full of welcome messages to Super Junior for their KCON LA visit. The final book was picked up from our booth before we could take a video but we did manage to take the photo above. A big thank you to all the ELF who participated! Super Junior sadly did not win any daesangs at award shows (GDA, MAMA, etc) in 2014. USA ELF, along with Vietnam ELF, Arab ELF, Brazil ELF, Poland ELF, Brunei ELF, Argentina ELF, Egypt ELF, France ELF, Chile ELF, Peru ELF, Uruguay ELF, El Salvador ELF, Russia ELF, Belarus ELF, Ukraine ELF and Kazakhstan ELF, joined together to show our endless love and support. Super Junior will always be the daesangs in our hearts. Oppa, this world is covered by sapphire blue.